This, over the past year, has become my go-to chili recipe. It’s not the kind of chili that’ll win a Texas-style cookoff, but it’s rich in flavor, homey, and satisfying. 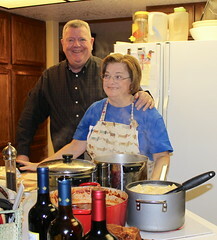 The Cannolis, Ditalini’s sister Gina and her husband Lengua, visited over Christmas, bringing with them venison from deer hunter country, upstate Michigan. The other day I pulled out a package of ground venison out of the freezer and decided to do something with it. Chili sounded about right, and I quickly found an interesting recipe on the net, attributed to an Alabama man named David Rainier. 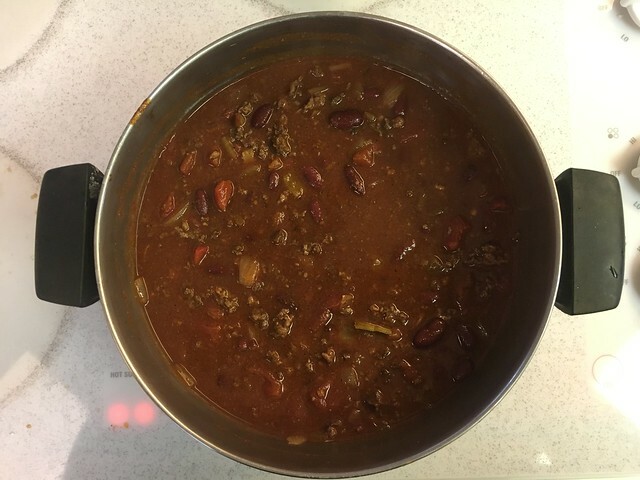 His recipe called for four pounds of ground venison and the other ingredients were scaled accordingly, making a big batch of chili to serve 10-12. I had about a pound and a half, so I scaled everything back. His version called for liquid crab boil … that’s what caught my eye, by the way, and I’m glad it did … but all I had was a can of powdered Old Bay seasoning, so I substituted. What follows is my version of Mr. Rainier’s recipe, tailored to the ingredients I had on hand, which makes enough to serve 4-6. Heat olive oil in a heavy cooking pot and sauté garlic, onions and pepper until tender. Add venison and brown for 10 minutes over medium heat. Add tomatoes, tomato sauce, kidney beans, chili powder, cayenne pepper, Old Bay, salt, garlic salt. Mix together and add bay leaves. Bring to a boil and simmer uncovered for 2-3 hours. I’ve made this chili at least a dozen times now and have never added green bell pepper: I don’t think it needs it. This chili is surprisingly rich. Not sure if it’s the Old Bay or what, but it was great, even if far from traditional. We served it with cornbread made from the standard recipe that comes on the cornmeal box, improved upon with diced Hatch chilis and shredded cheddar added to the mix just before baking. © 2019, Crouton deMenthe. All rights reserved.